February has arrived, and that means that the worst days of winter are almost behind us (even though Punxsutawney Phil suggested otherwise upon seeing his shadow yesterday). Speaking for myself, this has been a mild winter so far, at least by East Tennessee standards. It has snowed just three times, with zero inches of accumulation at lower elevations, and we’ve had nary a day of below-zero temperatures. Even my birthplace of Chicago has been spared its usual 10-week Arctic blast, save for a few exceptionally chilly nights of course. Still, we’re not out of the woods just yet. February can be nasty cold. It is also said to be the best month for viewing the Northern Lights. It was with this weather phenomenon in mind (the Aurora Borealis, not the cold) that I joined my friend Jules for one long, crazy, February, 2007 weekend…in Barrow, Alaska. I met her at Seattle-Tacoma International Airport (IATA code: SEA). Seattle – not Anchorage – is the hub for Alaska Airlines, and there are several flights/day to various cities along the Alaska Panhandle. 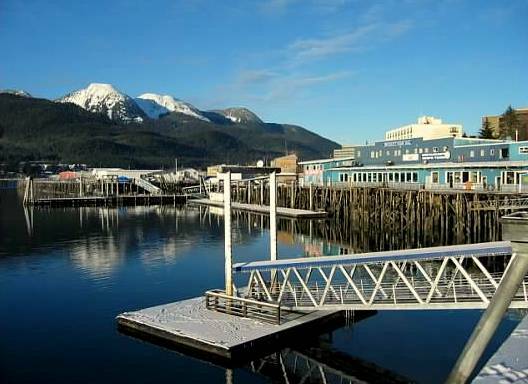 Our first flight took us to Ketchikan (KTN), the “Salmon Capital of the World” and the southeasternmost borough in Alaska. The city itself has a population of just over 8,000 people. We both scored window seats; the views were stunning. Snowcapped peaks and white pine forest dominated the view for the entire two-hour flight. We were on the “milk run,” that is to say, a city-to-city puddle jumper. By the end of the weekend, we would clock twelve separate flights. Many times, these flights land just long enough to offload passengers, freight, and mail before continuing to the next destination. In the case of Ketchikan, we had a 90-minute layover and decided to deboard. Immediately outside the tiny airport is a ferry terminal. 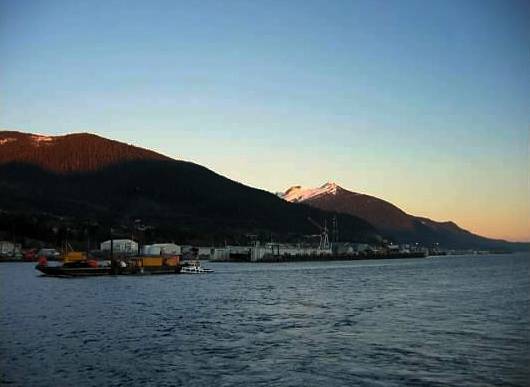 Ferry boats meet each arriving and departing flight and make a quick, free crossing over the half-mile-wide Tongass Narrows to the edge of town. We sailed across. It was late afternoon and the sky was a perfect shade of pink. We disembarked from the ferry, snapped a few pics of the mountainous backdrop, then reboarded for the quick ride back to the airport and our next stop, Sitka. We passed through the security checkpoint just in time to see our plane pulling back from the gate. Apparently, the airline assumed we were still on the plane (our luggage certainly was) and left early without us. We were livid, yet remained calm. We knew that our original plane’s last stop of the night was in Juneau, where we had a hotel reservation, and we figured we could meet our luggage there on the next flight. We passed the time snacking on popcorn and beer at the only restaurant in the airport. Finally, a direct flight to Juneau arrived, and we snagged the last two seats on board. We arrived in Juneau, Alaska’s picturesque capital city. Our luggage was not waiting for us, but we were promised that it would be forwarded to our hotel first thing the following morning. We took a taxi to our hotel. I can’t speak for my companion, but I remember falling asleep the moment my head hit the pillow. I awoke early the next morning, ravenous. Beer + popcorn for the previous night’s dinner does not a meal make. Our bags were indeed delivered to the hotel; it was nice to enjoy a change of clothes. We had two hours to walk around the city. It was cold but not freezing, and the sky was that gorgeous shade of deep blue. We had a look around the harborfront, which has an Old West/gold rush feel to it. It was deserted on this winter morning but would surely be mobbed with cruise ship passengers enjoying one of their requisite stops along an Inside Passage sea cruise five months later. Our cab driver was a font of knowledge about the region. He drove us past the State House, and stopped off near a Russian Orthodox church for a photo opportunity. At the time of our trip (2007), I had yet to hear the name Sarah Palin, but the cabbie was ecstatic about how well-run the State of Alaska really is. We were still several flights from Barrow. We didn’t disembark at any of the Milk Run stops, although we enjoyed the scenery from our seats and snapped many pics. Our only lengthy stop was Anchorage, where we had a plane change and a two-hour layover before our connecting flight. ANC is a nice airport. Our next flight still didn’t take us to Barrow; we first stopped at Deadhorse/Prudhoe Bay (SCC). 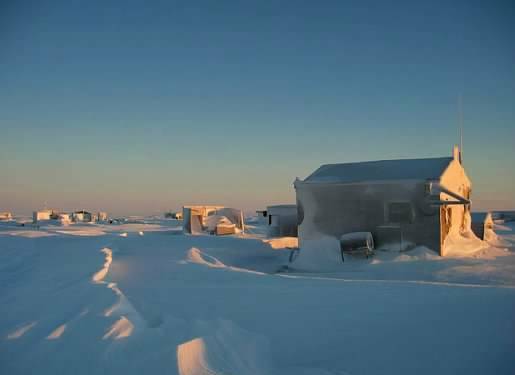 The town of Prudhoe Bay has a population of just over 2,000 people, but supports a much larger community in the form of transient workers at its nearby oil fields, which form the beginning of the north-south Alaska Pipeline. Prudhoe Bay is also the northernmost terminus for the Pan-American Highway, and is well and truly above the Arctic Circle! Incidentally, not long after our plane left Anchorage, I noticed, in the fading light of late afternoon, a large white mass rising out of nowhere in the distance. I could be wrong, but I pegged that landmass as 20,322-foot (6,194-meter) Denali – aka Mt. 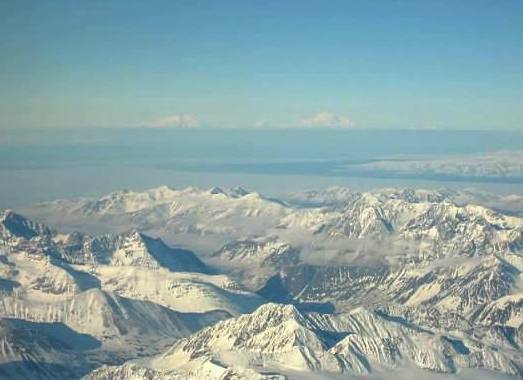 McKinley, the tallest mountain in North America. I have always hankered to visit Denali National Park, but I haven’t made it there yet. The flight to Barrow was packed to the gills, and Jules and I were not seated together. I remember ribbing her later about her seatmate, an oversized, flannel-wearing Paul Bunyan-type. In a weak attempt at humor, I asked Jules if he happened to mention anything to her about where he buried his axe, but she wasn’t amused. We landed in Barrow (BRW) around six p.m. There were no cabs in this thriving metropolis of 4,000 people. We were about to ask someone for a ride to our hotel, the King Eider Inn, when we noticed it directly across the road from the terminal building! We bundled up and raced across the street. Upon check-in, we learned that Barrow is a dry community, that it is majority-Inuit (Eskimo), that the Northern Lights had indeed been visible of late, and that our hotel clerk regarded two unmarried people of opposite genders traveling together as something suspicious. We stepped out into the night. It was cold, but tolerable. There wasn’t a soul outside besides the two of us. I scrambled onto a huge snowdrift and generally acted like the goofy man-child that I so often was (and still am). We wandered down to a Chinese restaurant and were the only non-Inuit customers. I guess it never dawned on me that the Eskimos of elementary school history lessons really exist, and that they live in actual towns, not just in igloos. It was considerably colder when we walked back to our hotel, but I’ll chalk that up to the wind chill factor. I noticed a cemetery, just off the main road. Although the community burial ground featured just a few graves, it was creepy to behold after dark, with a frozen coating of snow outlining the few tombstones that existed. The fabled Northern Lights were still nowhere in sight. The hotel receptionist said that the Lights don’t usually make their appearance until midnight. We waited…and waited…and waited. I don’t remember if I made it to midnight, but ultimately I was so exhausted from the day’s early wake-up and numerous flights that I couldn’t fight my tiredness anymore and fell asleep before the Northern Lights made their appearance – at roughly 2:30 a.m., I learned after the fact. 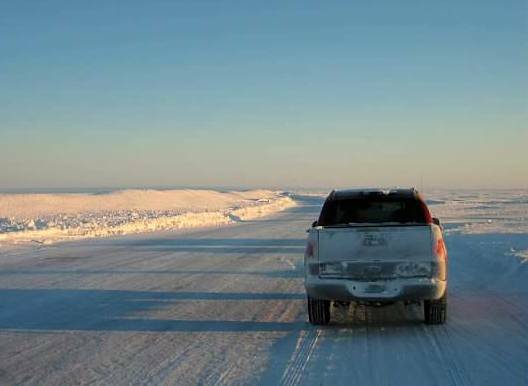 The next morning, we rented a pick-up truck from the hotel, knowing that Point Barrow and other places of interest near Barrow were not accessible by foot – at least not in below-zero temperatures. I noticed that the truck was plugged into the wall to keep its engine from completely freezing. I wonder what the average electric bill is in Barrow during the winter months?! The first thing I noticed was the fact that all single-family homes are built on blocks, one or two feet above the ground. This is most likely because of the permafrost, which (as the name suggests) never really melts. The second thing I noticed is that Barrow is rife with cheeky signs, whale bone arches, etc. These kitschy curiosities exist solely for the tourists. 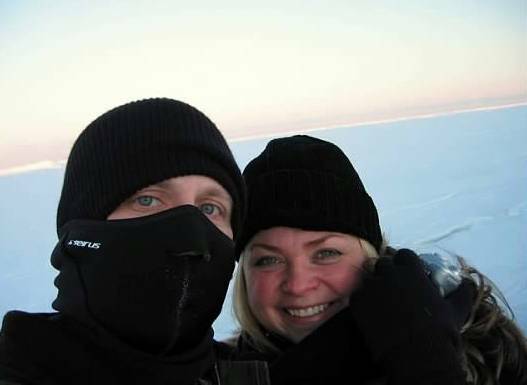 We visited as many of them as we could find, of course, and stopped off for a photo opportunity with the frozen Arctic Ocean in the background. It was colder than yesterday, and I learned later that the “high” for that day was -20 Fahrenheit. Brrr! 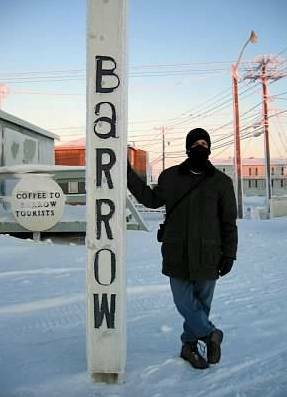 We drove to Point Barrow, the northernmost point in the United States. There was nothing to see. 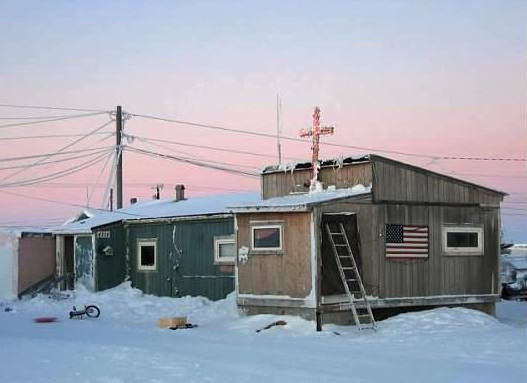 Alaska is known as a mountainous state, but up in the North Slope Borough, the land is as flat as a pancake. It was surprisingly bright, too. In school we think of everything above the Arctic Circle as being pitch black for four months of the year, but that is far from accurate. 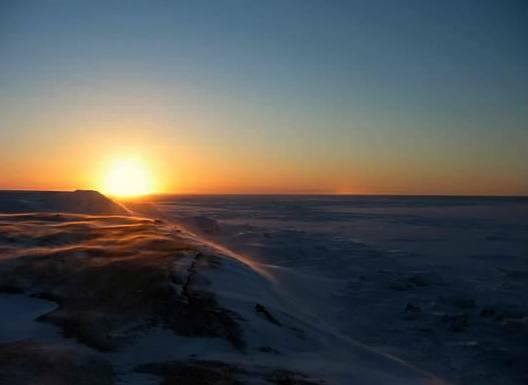 The sun never rose very high above the horizon – and not until almost 10 a.m. – but with the sea frozen over and no mountains to provide shade, it was a flat expanse of white off of which the sun reflected. As it turned out, sunglasses would have been in order! Jules was in contact with someone from NOAA, the National Oceanic and Atmospheric Administration. NOAA has a large facility just outside of Barrow, and we were hoping to arrange a tour. The tour ultimately fell through, so instead we spent the remainder of the day driving around photographing more Barrow oddities. In addition to the aforementioned whale bone arch, there was a wooden outhouse, open to the elements. There were seal skins left hanging to dry outside. 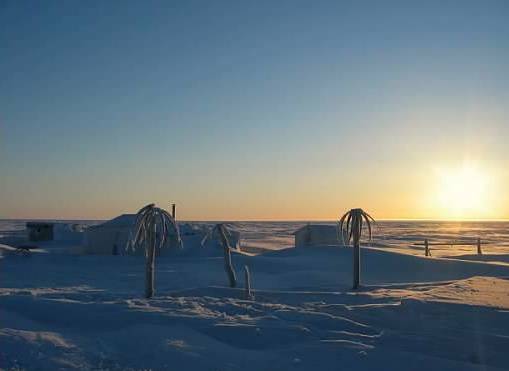 A trio of palm trees near Point Barrow. The world’s northernmost totem pole. We kept our eyes peeled for polar bears, but each time we thought we saw one, it turned out to be a large block of dirty snow. 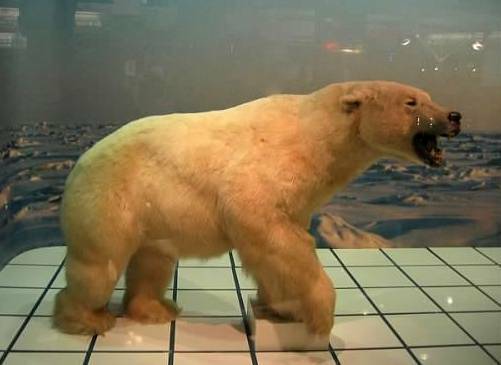 About polar bears: The majestic ursus maritimus (literally: sea bear) is the most-feared beast in and around the Arctic Circle. I learned that polar bears do not have any natural predators, and that they travel into town on ice floes during the warmer months. They eat fish, seals, walrus, reindeer, and – yes – sled dogs. 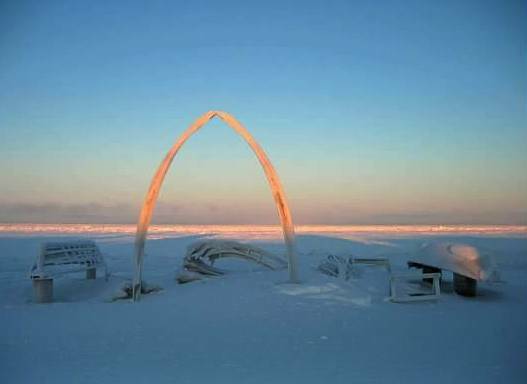 Barrow has an alarm system for polar bear sightings that is similar to the tornado sirens of the Midwest. When that alarm blares, bring your dogs inside. Somewhat remarkably, polar bears have black skin beneath that luxurious coat of white fur. Much less remarkably, the polar bear will almost certainly become extinct as global warming continues and the polar ice caps continue to melt. Speaking of polar phenomena, as we drove back to town to grab some dinner, we stopped off at a bluff of sorts (probably just a hard-pressed snowpack in flat, flat, flat Barrow) to photograph the pink sky of late afternoon. The wind had picked up and the cold was bone chilling. Still, we weren’t ready to return to the truck just yet, as we noticed a strange light pattern in the sky. It wasn’t green, which is the most commonly-seen color in the Aurora Borealis, but a barely-noticeable pinkish-orange “splotch,” just above the horizon. It wasn’t moving and it seemed a million miles away. Was this part of the Northern Lights? I raced back to the truck to grab my camera. I removed my outer layer of gloves to operate the camera. Although I was still wearing an inner layer of gloves, they were thin, and no match for the elements. Jules waited inside the truck while I snapped a few pics, my whole body trembling from the extreme cold. Satisfied with my pics and (at the time) convinced that I had just seen the Northern Lights – in daylight, natch – I returned to the truck. My friend’s first comment: “Gringo, you’re shaking!” I was indeed. My teeth were chattering. Eight years have since passed, yet that sunset photo shoot on the bluff remains the coldest I have ever been. We returned the car after dinner (being sure to plug it in) and checked in for our flight. The full name of Barrow’s airport is Wiley Post-Will Rogers Airport, named after the American aviator (Post) and humorist (Rogers) who perished in a 1935 plane crash near Barrow. I don’t know the model of our Alaska Airlines plane from Barrow to Fairbanks (FAI), but it had an interesting layout: passengers board in the back, and the front half of the plane is walled off for cargo storage. It isn’t really surprising, though; for much of the year, the one or two flights a day into and out of BRW are the only means of supplying Barrow with food and connecting it with the rest of the world. When it comes to remembering details of my travels, my brain is like a sponge. I still remember a fun, interactive writing exercise that Jules and I did on the flights from Barrow to Fairbanks and from Fairbanks to Anchorage. The trip was a whirlwind one, and my tireless mind was excitedly processing all that I had taken in. I finally managed to sleep on the third flight of the night – a red eye from Anchorage to Seattle. Did I really see the Northern Lights? I don’t know. Probably not. Would I return to Barrow? I don’t know. Probably not. Would I return to Alaska in general? Absolutely. 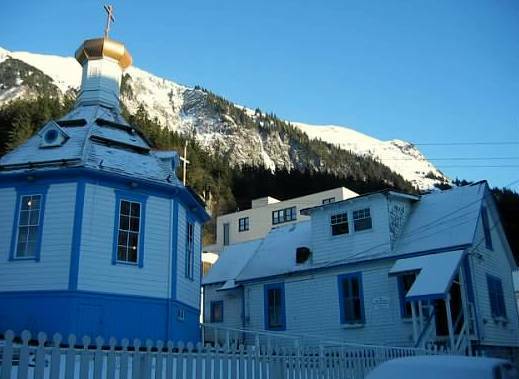 Alaska is technically part of the U.S., but in many ways it is an entirely different world. And you can’t see Russia from its backyard. OMG: “…a fun, interactive writing exercise that Jules and I did on the flights from Barrow to Fairbanks and from Fairbanks to Anchorage.” I had totally forgotten about that! We were sitting across the aisle from each other doing a sort of mad-lib style soap opera story, handing it back and forth. We were laughing our asses off. Good times! Thumbs up for cool seatmates and travel buddies!